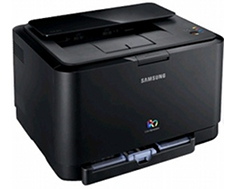 The Samsung CLP-315 is a color laser printer that offers quality color printing in a small, easy to manage package. The case is designed to look sleek and stylish and the manufacturer advertises this model as not only a fully functional, top notch printer but also a nice looking desk accessory. Samsung utilizes what they call NO NOIS print mechanism technology for whisper-quiet printing in home offices or small businesses. A second model variation, the CLP-315W, offers Ethernet networking capabilities. The Samsung CLP-315 offers print speeds of up to 17 pages per minute for black and white and 4 pages per minute for color. First page out time for both black and color printing is less than 14 seconds for the CLP-315 and less than 19 seconds for the CLP-315W. A maximum print resolution of 2400 x 600 dots per inch is available on both model variations to ensure crisp, clear printing in both black and white and color, whether it be text documents or full graphic pages with vivid color. Both models have a 360 MHz processor and the CLP-315 comes equipped with 32 MB of page memory to handle the most graphic-intensive print jobs with minimal delays. The CLP-315W comes with 64MB of RAM to ensure effortless operation as a shared network resource during print queues. The rated monthly duty cycle for both models is 20,000 pages per month, allowing for a couple hours of printing each day without excessive wear and tear, which is suited for smaller volume needs. The CLP-315 comes with a fast USB 2.0 direct connection interface for the individual and home office user and the CLP-315W adds a fast 10/100 Ethernet wired connection with 802.11 Wi-Fi, suited more towards small offices, for easy connection as a shared resource with PC's, laptops and PDA's. The maximum paper input capacity for both printers is 150 sheets of paper up to legal size. The output tray holds a maximum of 100 sheets. Media weights that can be accommodated range from 16 to 43 pounds. Supported media types include plain paper, envelopes, transparencies, labels and light card stock. Supported operating systems include Windows 2000, XP, 2003 and Vista, as well as Mac OS X and four different builds of Linux, making this a well-rounded machine that can connect to virtually any computer OS configuration. Both models are designed to print quietly, with less than 47 dBA of noise for black and white printing and less than 45 dBA for color, making this one of the quieter laser printer models on the market. Power consumption is less than 350 Watts when fully operational and less than 10 Watts when in standby mode, making both models Energy Star compliant. A dimensional footprint of 15.3 x 12.3 x 9.6 in. and a weight of 24.3 pounds makes this printer light and small enough to fit on the smallest and least solid work spaces. Monochrome print speeds, on average, are quite slow for printers in this class that function only as printers. 4 pages per minute for color is extremely slow and is only rated for small business or home office use. A duplexing feature is included, but it is not fully automatic, requiring manual page reloads for printing on both sides of a page with driver guidance. There is no manual bypass loading capabilities, so thicker stocks and special media types are not supported. This printer is designed specifically for printing on standard media types. Windows 7 support is not guaranteed, which might pose problems for people who wish to buy this printer to be used with a new computer system. Limited functionality might result. 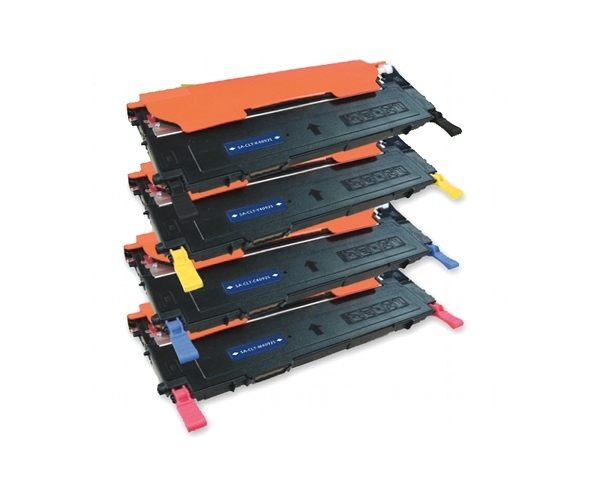 Review it: "Samsung CLP-315 "
The Samsung CLP-315 and CLP-315W come with a starter toner kit that contains a black cartridge with an average yield of 1,000 pages and color cartridges (cyan, magenta and yellow) with an average yield of 700 pages each. 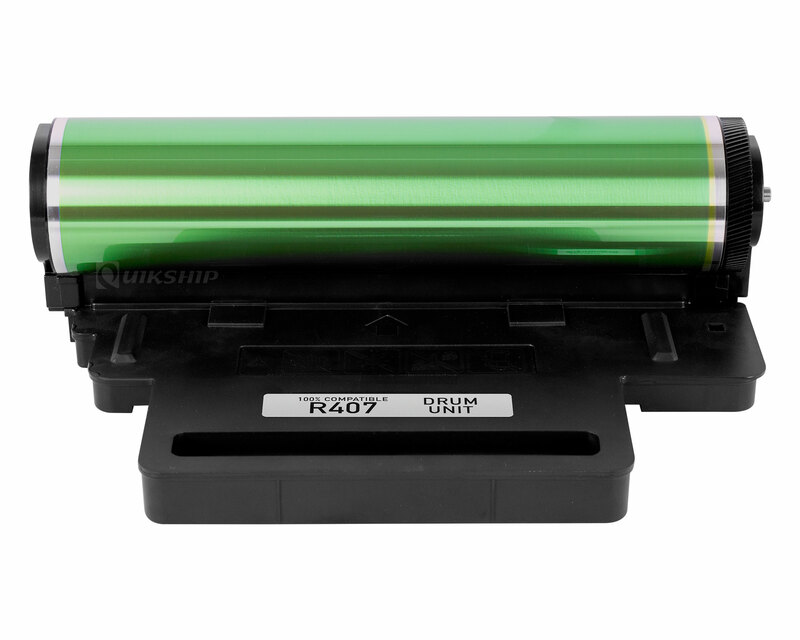 Toner cartridge replacements offer an average yield of 1,500 pages for black and 1,000 pages for color. An optional imaging kit comes with average yields of 24,000 pages for black and white and 6,000 pages for color.